We began looking into the different childcare options like you do. Both myself and Giuseppe work in London. Giuseppe catches the 7:20am train and for my 3 days at work I catch the 6:50am train therefore, the option of getting 2 babies/children out of bed, washed, dressed, breakfast (including ourselves!) and to nursery for 6:30am in the morning wasn’t an option. Although we didn’t look into the Nanny coming to our house option, I’m not sure we’d have found anybody keen enough to want to arrive at 7am! The money we would have spent on nursery fees we spent upfront by putting an extra bedroom and shower room onto the house (not an option for everyone) so that we had the space for an Au Pair. Go with your gut feeling despite what the CV says. Don’t invite a gorgeous blonde to live with you, it will only create tension for your fella! Look for the ones that would like to work with children as a career or have already worked with more than 1 child rather than somebody just “wanting to have a great time in London & enjoy socialising”. They won’t stay! 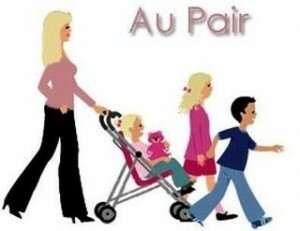 We use a website called www.aupair-world.net. Now……. this is only a platform for you to search for different nationality people that are looking to come to the UK to work for a short time as an Au Pair. Friends of ours prefer to use websites that do the vetting for you by getting references, police checks etc done. These companies charge around £500 for this service. Au Pair World charges 39 euros. We have had 2 great Au Pairs and one that we asked to return home after a few weeks. The word French term Au Pair means ‘on a par’ or ‘equal to’. This means they form part of your family and live in and around you rather than simply being an employee that you thank and say goodbye to at the end of each day. In return for them helping with your children and providing 2 babysitting sessions per week, they have a nice room, tv/dvd player, as much food as they need to eat, and bills all included. Depending on how many hours they work is dependant upon how much ‘pocket money’ you give them each week, this varies from £75 to £150. Au Pairs have moods/down days too! You tend to feel like their parents!